Making the sale and computing for profit and revenue is not the end of determining the success of your business. It simply means you made a certain amount of money on that day or week. To develop your business into an impactful establishment, you have first to study basic computations and analysis of the records you have. This starts with learning conversions and conversion rates. Conversion rates make use of your sales value and the number of your visitors, determining how much took sales action. 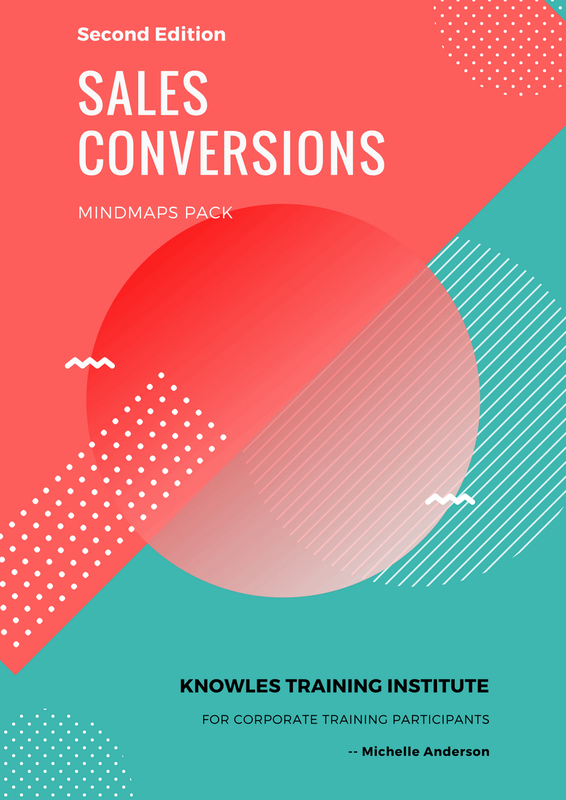 In this course, the participants will learn how to calculate for the value of conversion rates, apply them in practical situations, and increase them through online or traditional means. 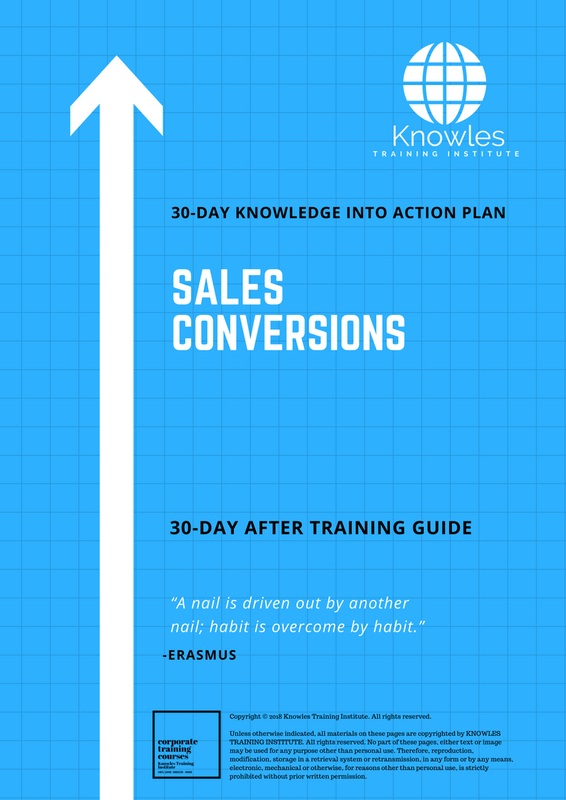 This Sales Conversions workshop is ideal for anyone who would like to gain a strong grasp and improve their Sales Conversions. 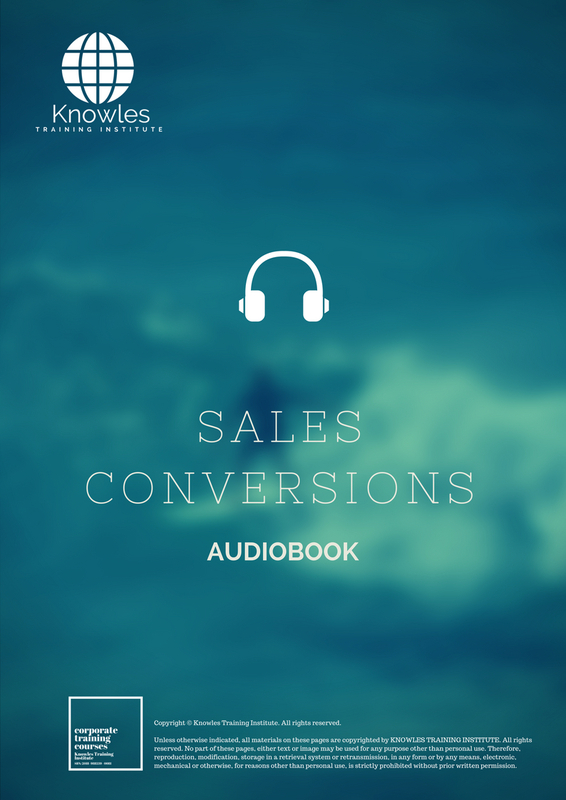 The duration of this Sales Conversions workshop is 1 full day. Knowles Training Institute will also be able to contextualised this workshop according to different durations; 2 full days, 1 day, half day, 90 minutes and 60 minutes. 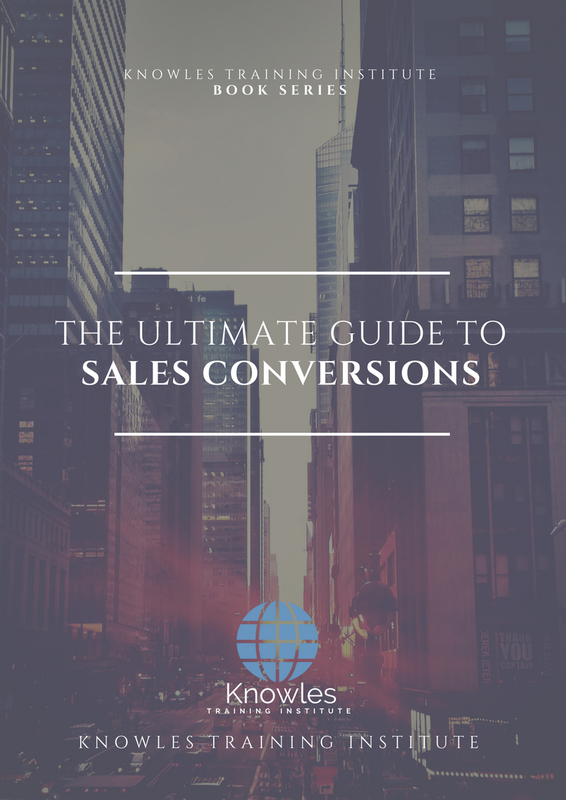 • What is sales conversion? What is conversion rate? • What is a good conversion rate? What does it signify? • Conversion rate optimization: How do you improve and increase your conversion rate? • What does a low conversion rate mean? • Activity: Compute for the conversion rates of each business and compare it to the rates of the industry where they belong. What are the simple ways they can increase their conversion rates? 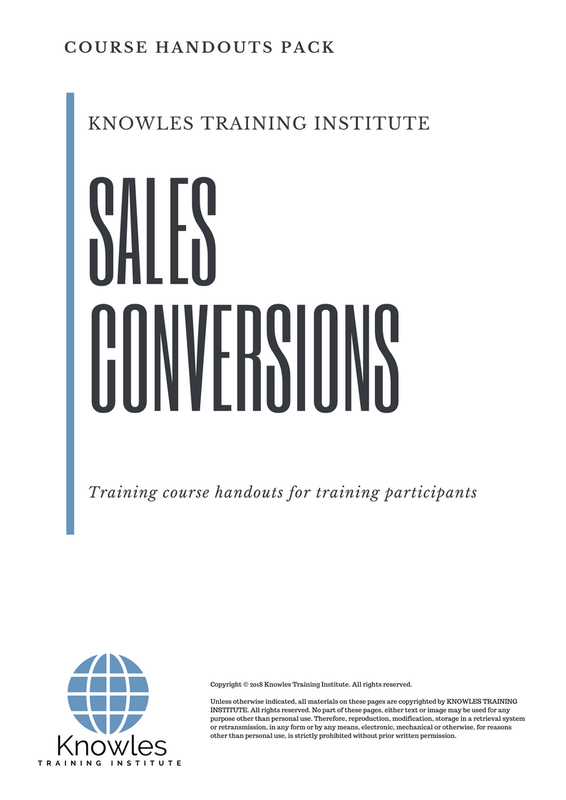 There are 3 pricing options available for this Sales Conversions training course. 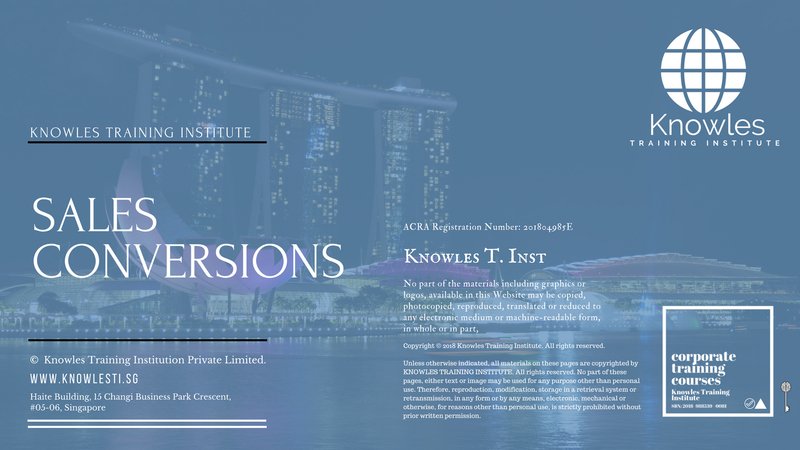 Course participants not in Singapore may choose to sign up for our online Sales Conversions training course. Our subject matter experts stimulate discussions, generates ideas, foster curiosity and excitement among all of our training participants. All of our trainers have a minimum of 10-20 years in the training industry. What Course Schedule Would You Like to Receive? 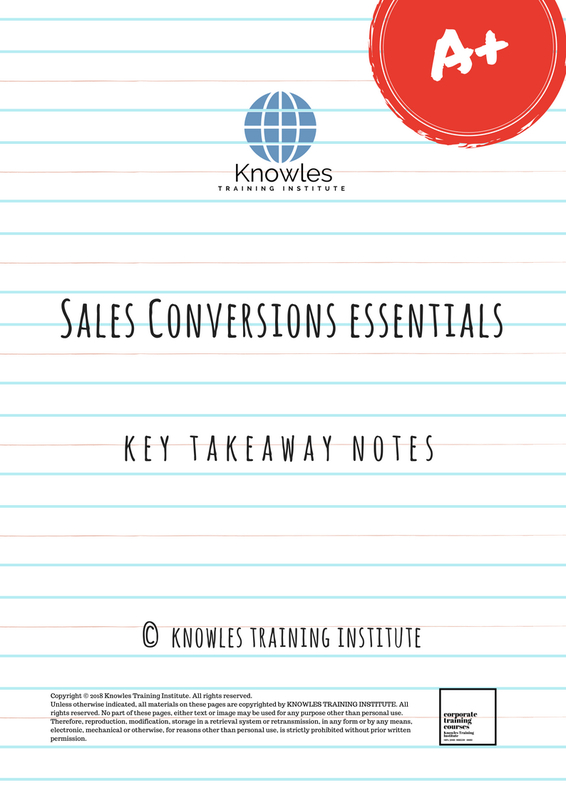 Request for this Sales Conversions course brochure. Fill up the short information below and we will send it to you right away! Why Register For This Training Course? Post Training Support: A vast majority of training does not have any effect beyond 120 days. To work, training has to have a strong pre- and post-training component. Post-training reinforcement helps individuals to recall the understanding and ask questions. Blended Learning: Learning does not occur in the classroom. Virtually everybody prefers distinct ways of learning. Successful learning should have a multi-channel, multi-modal strategy. We Understand The Industry: We’ve got a profound comprehension of the business, business design, challenges, strategy and the that our participants are in and have designed the courseware to cater to their professional needs. 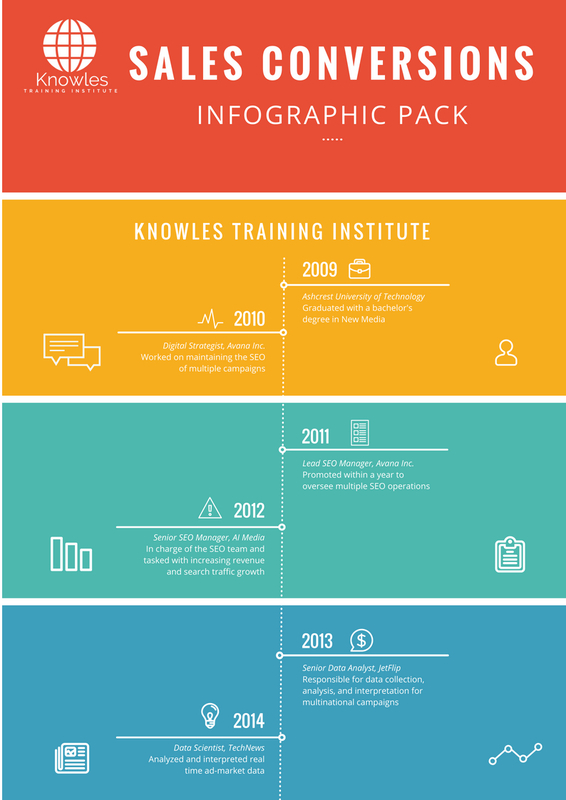 Course Content: Knowles Training Institute’s material is relevant, of high quality and provide specific learning results. Participants will leave the training course feeling as they have gained a strong understanding and will also be in a position to execute what they have learned sensibly. Course Development — The workshop modules follow a systematic and logical arrangement. This structure helps to ensure that the course material allows the facilitators to deliver the course in a logical arrangement. Consider the subjects as building bricks into learning, our facilitators slowly build towards a comprehensive picture of this entire topic. Fill up the form and we will get back to you in less than 1 working day. Alternatively, give us a call to have one of our training consultants contact you. Our corporate training courses can be contextualised to meet your organisation’s training needs. Leverage on our large pool of professional trainers and consultants for your organisation’s training needs. 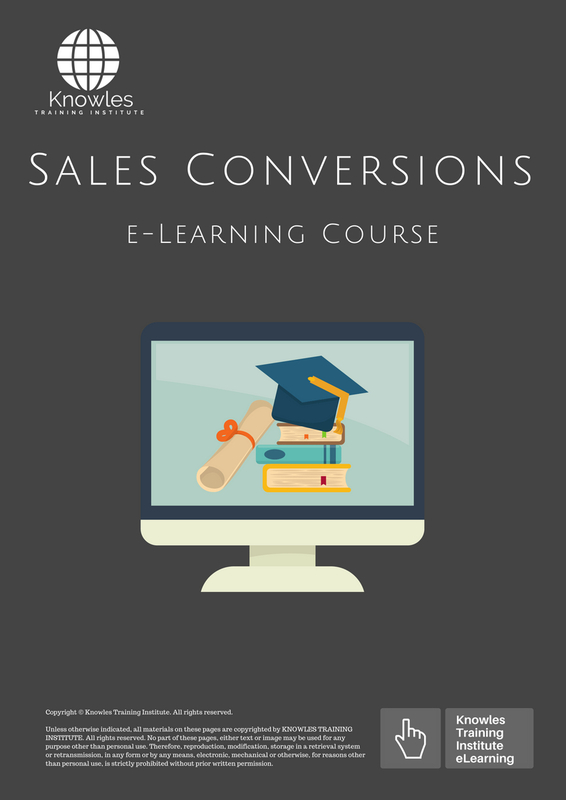 Register For This Sales Conversions Course Now! 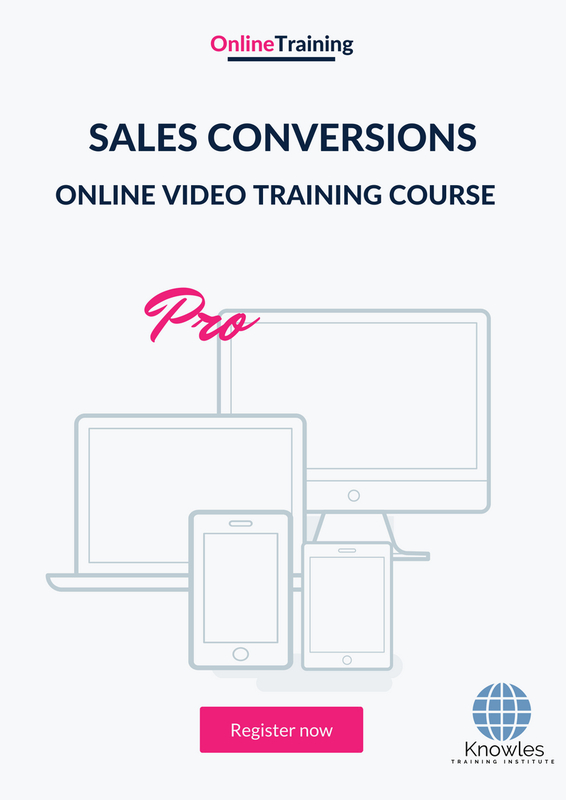 Share This Sales Conversions Training Course! 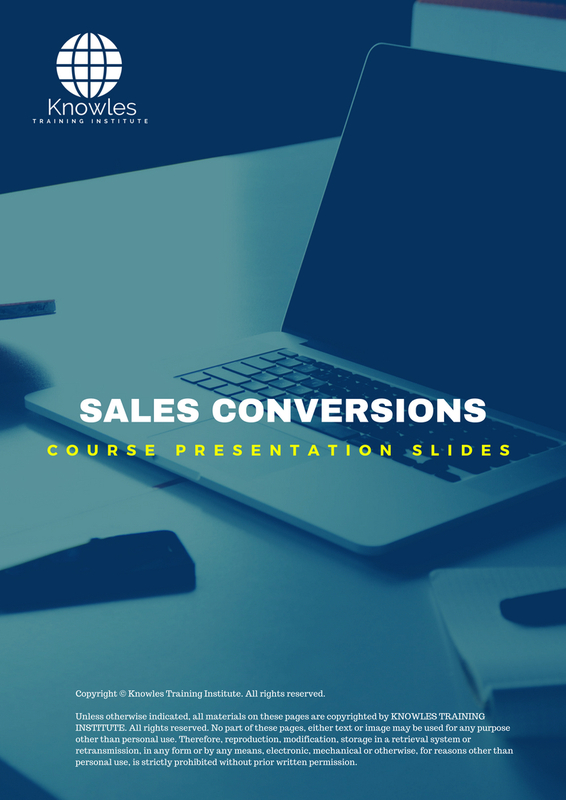 Sales Conversions course, workshop, training, class, seminar, talk, program, programme, activity, lecture. 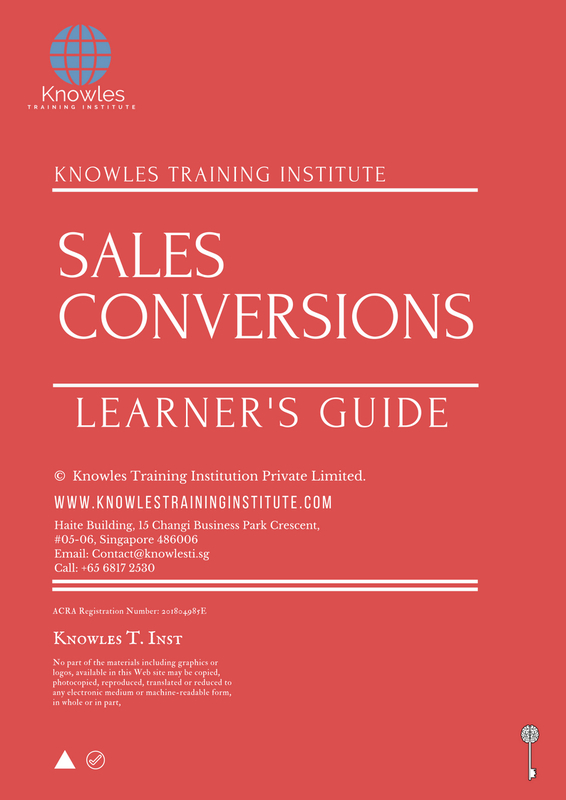 Sales Conversions courses, workshops, classes, seminars, talks, programs, programmes, activities, lectures in Singapore. Sales Conversions improvement tips, Sales Conversions techniques, improve Sales Conversions, improve Sales Conversions games, Sales Conversions improvement exercises, improve Sales Conversions power, how to have good Sales Conversions, how to have good Sales Conversions in studying, how to build up your Sales Conversions, how to improve Sales Conversions how to improve Sales Conversions course in Singapore. 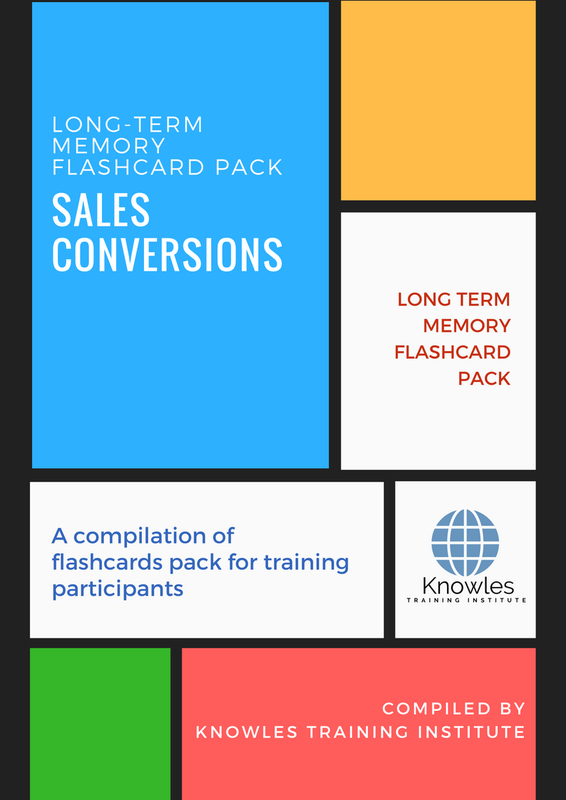 Enhance, boost, build up, enlarge, heighten Sales Conversions course in Singapore. Increase, intensify, raise, reinforce, strengthen Sales Conversions. Upgrade, amplify, boom, elevate, exaggerate, magnify, grow, gain Sales Conversions. Develop Sales Conversions, multiple, power up, beef up, bolster, establish, extend Sales Conversions. Invigorate, restore, step up, toughen, empower, fortify, regenerate Sales Conversions. Rejuvenate, renew, escalate, expand, maximize Sales Conversions. Powerful, mighty, impressive, competent, great, excellent, exceptional Sales Conversions in Singapore. Superb Sales Conversions. Super, superior, strong, solid, active Sales Conversions training courses and workshops in Singapore. Sales Conversions enhancement, booster, building up, enlargement, heightening, increment, strengthening, amplification. Sales Conversions magnification, growth, development, power, empowerment, regeneration. Sales Conversions rejuvenation, development, escalation, expansion. 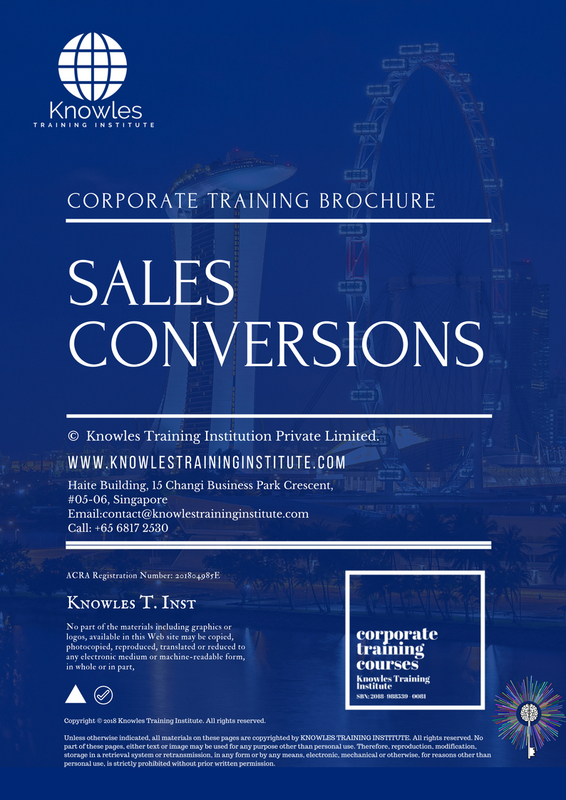 Sales Conversions maximization, power training courses & workshops in Singapore.